"Have you ever stopped to ask yourself why you care so much about the answers to your silly questions?" Silly questions? These questions had become the very rhythm of her cancer-laden life and now they were being labeled "silly." I wonder if this is how many youth feel when their young minds rattle off question after question in a world not yet done with claims of certainty. I fear youth may balk at asking questions, faith, life, death, and despair questions, assuming they will be received by the adults in their life as silly. So they write off church as Hazel Grace wrote off the one who wrote her most cherished story. So as I prepared to write a youth talk for this past Sunday, I returned to a short story I wrote for youth this past May. Youth resonated with the brief narrative, who had quote a few silly questions of his own, so I added the chapter below. 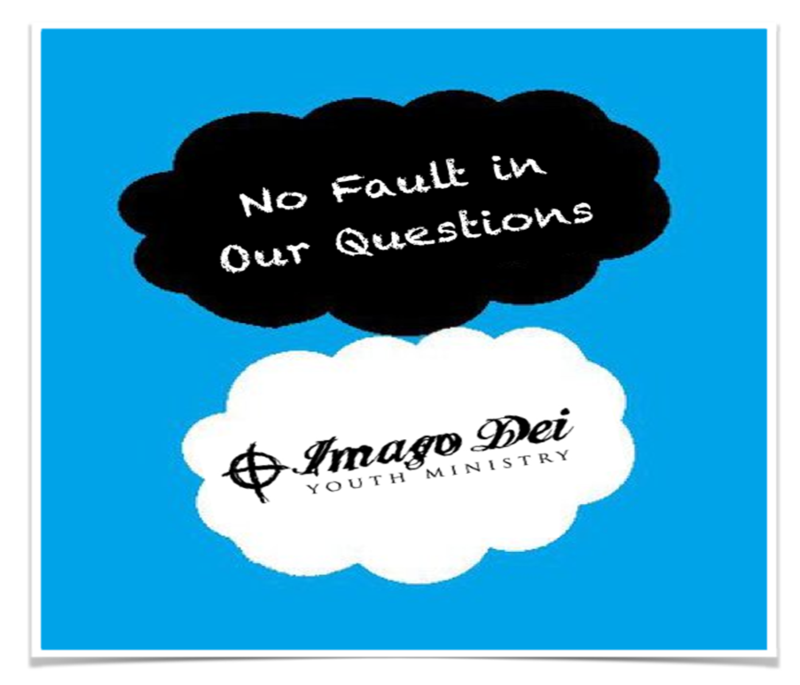 I pray youth, who may be a lot like Hazel Grace, would always know even their silliest questions are welcome in the church. Actually, these questions are not silly at all. They are markers of faith. Trey was entering his second year of high school. His first year was not so bad, although he could've done without the absurd amounts of homework his history teacher, Mr. Franklin, had handed out the second semester. His parents didn't seem to agree. They felt Trey didn't push himself hard enough, apply himself often enough, and frequently told him he needed to spend more time in the books if he wanted to get into a good school. "I'm 15," he would remind his parents. "Fifteen!" The pressures of Trey's freshman year were unexpected and overwhelming. They only increased his sophomore year. Track. Academics. Clubs. Piano Lessons (Trey hated the piano). Choir. O, yea. church. There was also church and the Second Presbyterian youth group. Trey struggled to fit that in and often had to surrender youth group and time with his friends because of an endless list of other responsibilities that demanded his time and attention. Yet Trey’s youth pastor, Hope, often reminded him that church and youth group were not to be one other pressure point. Actually, they were the very people Trey could count on to be there when the pressures were too much. They wouldn’t shun him if he missed a few weeks. That was always a breath of fresh air, but still, Trey felt bad he couldn't be as involved as he was over the summer. And Trey had quite the summer, nothing that surpassed his week-long mission trip with the youth group to Baltimore. That was an experience he would never forget. How could he? The questions were still wracking his brain. And so was Cora. Trey and Cora had struck up quite the friendship. Cora was also a high school sophomore and was the type of person Trey found intriguing. She was somewhat mysterious and didn't act as though she had everything figured out. She wasn't a glass half-empty kind of girl, but certainly didn't think the glass was always full either. Cora, much like Trey, was a bit of a skeptic and struggled to find her place in the youth group. That was, until she met Hope, their youth pastor. Hope and Cora had similar conversations as those Hope had with Trey. Hope also encouraged her to come along on the summer mission trip. That's where Cora and Trey met. More specifically, the two met serving meals at an inner city ministry on Martin Luther King, Jr. Boulevard. They spent a few afternoons in conversations with those who had called the streets their homes, most without a job. These new friends, as Trey liked to call them, broke all kinds of stereotypes about the homeless. Sure, there were recovering addicts and others constantly looking for another way to collect disability checks. Some with more legit explanations than others, of course. But there were also former college professors in their fifties and sixties who had been let go and unable to find another gig. There were parents of young kids who ended up on the streets after unexpected medical bills piled up because their employer didn't provide sufficient health insurance, leaving them bankrupt. There were veterans who had so many traumatic memories that they couldn't hold a job since returning from the horrors of war, some pains inflicted by fellow soldiers who used their rank as a means to assure secrets could be kept far too long. There were even those who had a job, but the cost of rent was too high that not even minimum wage could help them get off the street. Let's not forget the teenagers who were homeless. The stories were unbearable. Youth shared about being kicked out of their homes when their mom’s new boyfriend moved in or fleeing their homes because they couldn't take the violence and abuse any longer. The stories of Trey's new friends were endless. The summer mission trip challenged and confronted Trey more than anything ever thrown his way by Mr. Franklin. The same was true for Cora, which is why they became such good friends and were able to have conversations like the one on the bus on the way home from a day of serving one afternoon. "Trey, I thought this mission trip was going to teach me a lot about faith, God, and Christianity. Instead, I feel like everywhere I turn I am just faced with another story of despair," Cora said on the bus back to the retreat center where they were staying. "You're not alone," Trey agreed. "I was hoping this summer would be an opportunity for me to deepen my faith, maybe even find the answers to the many questions I have had for so long. But all I have come up with are..."
"Yes. More questions." Trey was grateful for Cora. While many in the youth group seemed more concerned about taking photos and posting to Instagram, Cora was really wrestling with each experience. Cora pondered, "Yea, where is God when a kids home life is so bad that it would be safer to live on the streets of Baltimore than spend one more night in the midst of so much yelling, screaming, and violence?" "What about when someone is diagnosed with a form of cancer but can't pay the mounting medical bills?" Trey wondered. "And then they go bankrupt, leaving them homeless when they recover." Cora added. "All of this also makes me think about stuff at our school. Like my friend, Chris," Trey began to whisper as though really uncomfortable, "who recently came out as gay to his family. Where is God in the midst of that?" "Don't get me going on that one," Cora replied back in certainly more than a whisper. They went on and on, listing everything from Christians who have been killed for their faith in the Middle East to natural disasters. They even talked about the ridiculous pressures they face with homework and after school obligations. “People seem to forget we are kids not CEOs!” Cora gritted her teeth. Trey nodded, thinking of his parents’ reaction to any and all of his complaints about school work. "Speaking of kids!” Trey knew Cora was on a roll now, so he just listened. “Child refugees! They are fleeing Honduras and Guatemala, without their parents, hoping to find safety in this country because the drug and gang wars have become too much for their parents to bear. They think it's safer for their young children, even toddlers, to ride a freight train from Central America through Mexico and into Texas, ALONE, versus stay home with their parents. Where is God there? I thought the kingdom of God, like Jesus said, belonged to children?" Trey chimed in, "Hope has said something before about Jesus being 'good news for the world.' Apparently gospel means good news. All I see around us lately is bad news. Is there any good news anymore?" That's when they realized Hope was on the same bus with them. Apparently she heard them chatting but didn't want to interrupt. But this last remark by Trey, she couldn't help but jump in on the conversation. Startled, they turned to see Hope with a bit of a grin. "That's the point of all this mess we call Christianity. That's the point of this trip to Baltimore. That's the point of following Jesus," Hope shared. "Gonna have to be a little more specific, Hope." Cora was obviously frustrated. "Gospel means good news,” Hope said. “Because we are to be those who ask the question, 'what could, would, and should good news look like in all those places and experiences you just mentioned. What does good news look like to gay youth or homeless cancer survivors? What does good news look like to Christians in Iraq, whose lives are in jeopardy every day? What does good news look like to families who have lost everything to a tornado, tsunami, hurricane, or fire? What does good news look like to the thousands of children fleeing Honduras and taking refuge in this country? What does good news mean for youth, like you, who are reduced to test scores and grade point averages in our achievement based culture?" Trey and Cora were both perplexed, but intrigued nonetheless. The last one especially got a few nods from Cora and Trey. "I don't know, Hope. Why don't you tell us? You seem to always have answers. I just have more questions," Trey lamented. "Trey," Hope's voice softened. "Christianity is not about answers. Christianity is about questions. Asking good and faithful questions. I have way more of them than you could even begin to imagine. I have doubts, too. Lots of doubts, especially because of all the bad news we hear, see, and personally experience." Cora jumped in, "I thought Christianity was about right belief? You know, getting the answers right." "Cora,” replied Hope. “If you think you have all the answers you are not a Christian." "No,” said Hope. “You're arrogant. A good follower of Jesus, a disciple, is someone who asks the right questions. Good news questions. Questions of despair and heart ache. Questions that center on the longing for the world to be better, newer, safer, cleaner, more equal, just, fair, and drenched in peace. Questions that ask, where is Jesus in this place and who is Jesus calling me to be alongside my neighbors near and far? Questions about evil, sin, suffering, forgiveness, life, and death, even life after death." Trey thought for a moment, "Is that why Jesus' disciples asked so many questions? Were they actually more faithful than we give them credit for?" Trey started to get it. "So we are supposed to ask not avoid questions? Like, what does good news mean to my neighbor whose parents just split up and is not sure what life will look like in the days and weeks ahead?" Trey immediately began to think of his friend, Sam, who didn’t talk much about his parent’s recent decision to split up. But he knew it was always on his mind. Hope nodded in agreement, “I hear you. I also frequently question God’s presence. But I keep working, hoping, praying, and believing good news is out there somewhere. So, as those who follow Jesus, when we see others suffering and in the depths of the worst kind of news, we are called to hear their questions, ask versus avoid many of our own questions, and then consider how can we begin to work towards good news much in the same way Jesus did. So, what might that look like for your friends you met this week or your friends, Sam and Chris, back home?" Trey paused. Cora looked at Trey, hoping maybe he would have a response. They both shrugged. "I'm not sure. All I have right now are a lot of questions, and we still have two more days on this trip.'" Trey said this, wondering if he was going to frustrate his youth pastor. "And if Trey has six questions. I have ten." Cora said, as though she wanted to back up her friend. Hope grinned again. "That's why I love teenagers. That's why I will never stop serving alongside teenagers." Again, the two friends were confused. "Because you ask the best questions. You're not afraid of questions. You challenge adults who all-too-often think they have all the answers and life figured out. In those moments, you push us. I think that's maybe why Jesus said we needed to have faith like a child. Not because of blind obedience, but because kids are always asking questions. And by asking questions, good news questions in the midst of so much bad news, only then do we begin to see the face of Christ. Only then do we actually demonstrate child-like faith." Cora smiled. "I have one more question, Hope." "No,” smiled Hope. “Our stop was the last one. Whoops."